Membership Information - Join Now! 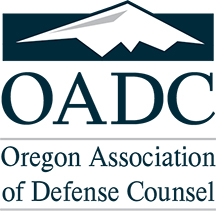 For over 50 years the Oregon Association of Defense Counsel has provided excellent continuing legal education for defense lawyers and a unified voice for defense concerns in Oregon. Join nearly 600 trial attorneys defending civil cases in the courts of Oregon that participate as members of OADC. For active attorney members of the Oregon State Bar who devote a substantial portion of their practice to representing the interests of individual defendants, businesses, insurance companies, or government entities in civil litigation. Membership dues are $200 for the first year of membership. After the first year of membership, annual dues are $310. Dues for those practicing in their first three years of law are $240. Legal educators who satisfy the above criteria, or who do not maintain an active practice, either plaintiff or defendant; existing members of the state or federal judiciary; and practitioners who devote their entire practice to performing arbitration/mediation/reference judge services. Neutral members are non-voting members of association. Membership dues are $200 for the first year of membership. Annual dues thereafter will be $310. To download a PDF of the membership application, please click here. Fax completed applications to 503.253.9172.